Let your helium-filled Balloons soar this season while you tether them with the exclusive 15 Gram Happy Butterfly™ Happy Weight™ (neon colored butterfly balloon weights), designed and manufactured by Creative Balloons Mfg. Inc. of Carmel, California (USA). Happy Butterfly™ (15 gram plastic neon butterfly balloon weights) has been developed to tether 1 – 32″ Helium Filled Shaped Foil Balloon (perfectly matching Butterfly, Dragonfly, and Flower shaped balloons) or 4 – 10″ Helium Filled Latex Balloons. No need to let go of your helium-filled balloons, that bring so much joy and color to your life, when you can hold on to them with Happy Butterfly™ Happy Weights™. 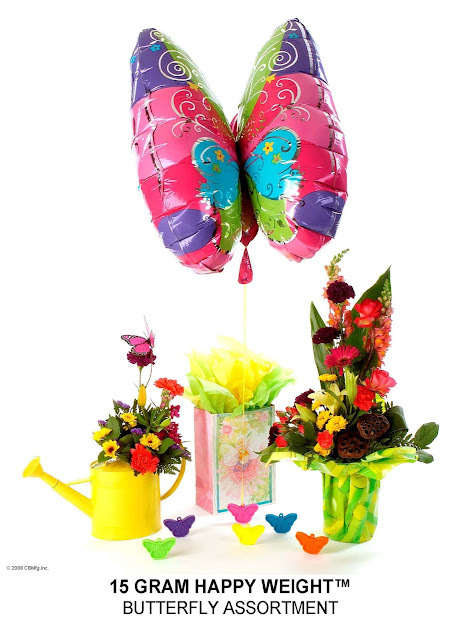 Ideal for balloon bouquets, garden parties, spring time events, princess birthday parties, and gifts. Available in six (6) Trendy Neon Colors (Hot Pink, Lime Green, Deep Purple, Sunshine Yellow, Bright Orange, and Turquoise Blue), this delightful assortment of butterfly balloon weights is whimsical, colorful, and purposeful. Each Happy Weight™ is 100% recyclable, and meets CPSIA and CE safety standards. The Happy Butterfly™ Assortment of Happy Weights™ is available through Authorized Distributors. Retailers can contact Creative Balloons Mfg. for referral to a Distributor in their region, or can ask their Distributor for product samples and pricing.